Recombinant bovine interleukin-2 detected using Human anti Bovine interleukin-2, clone AbD21766 (HCA267) as the capture antibody and Human anti Bovine interleukin-2 clone AbD22297 (HCA268) followed by Mouse anti Histidine Tag:HRP (MCA1396P) as the detection reagent. PBMC from naturally Mycobacterium bovis infected cattle were stained using Human anti Bovine interleukin-2 antibody, clone AbD21766, conjugated with Alexa Fluor 647 (HCA267A467) at a dilution of 1:8. Human anti Bovine Interleukin-2, clone AbD21766 recognizes bovine interleukin-2 (IL-2), also known as T-cell growth factor (TCGF). 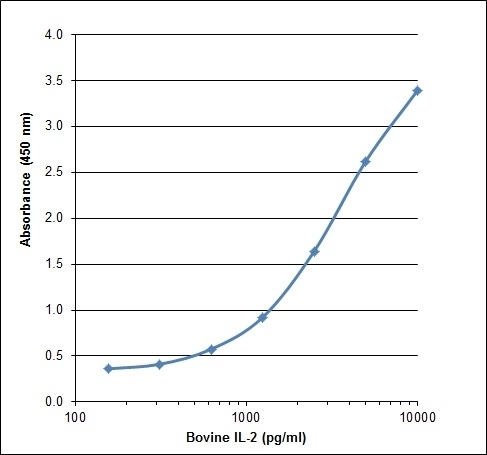 Bovine IL-2 is a 155 amino acid secreted cytokine produced by T-cells following antigenic or mitogenic stimulation. It plays a crucial role in T-cell proliferation and immune regulation. Human anti bovine interleukin-2, clone AbD21766, has been successfully used for the detection and measurement of native and recombinant bovine IL-2 using intracellular flow cytometry, ELISPOT and ELISA. 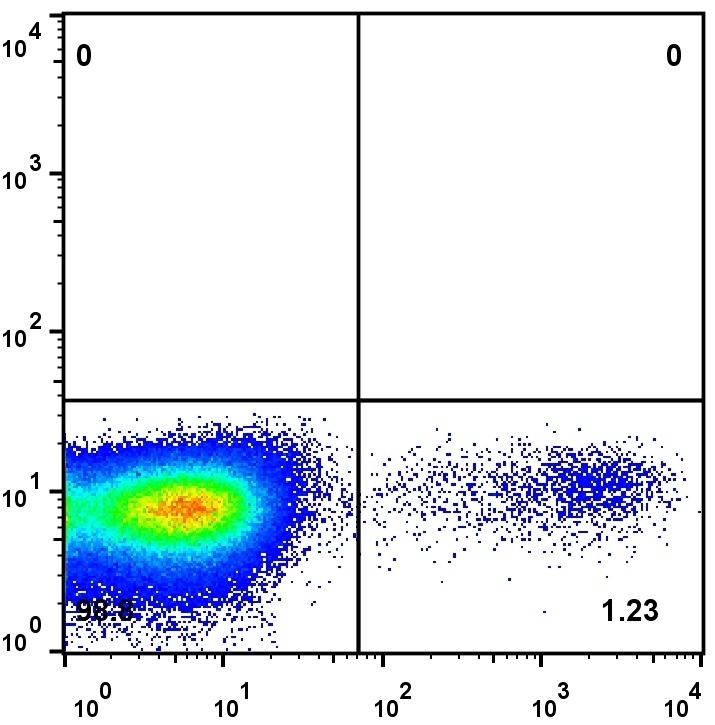 In ELISA and ELISPOT clone AbD21766 functions as the capture antibody in a sensitive assay for bovine IL-2 determination. A monovalent human recombinant Fab (kappa light chain) selected from the HuCAL® phage display library, expressed in E. coli. The antibody is tagged with a DYKDDDDK tag and a HIS-tag (HHHHHH) at the C-terminus of the antibody heavy chain. Conjugated to Alexa Fluor 647 (A647) - liquid. A monovalent human recombinant Fab (kappa light chain) selected from the HuCAL® phage display library, expressed in E. coli. The antibody is tagged with a DYKDDDDK tag and a HIS-tag (HHHHHH) at the C-terminus of the antibody heavy chain. Fc-fusion protein containing the amino acid sequence 21-155 from bovine interleukin-2. The monovalent intrinsic affinity of this antibody was measured as KD=0.3 nM by real time, label-free molecular interaction analysis on recombinant bovine interleukin-2. Use 10ul of the suggested working dilution to label 1x106 cells in 100ul. Membrane permeabilization is required for this application. Bio-Rad recommends the use of Leucoperm (BUF09) for this purpose. This product may be used as a capture antibody in a sandwich ELISA together with HCA268P as the detection reagent. Rhodes, S.G. et al. (2014) Use of antigen-specific interleukin-2 to differentiate between cattle vaccinated with Mycobacterium bovis BCG and cattle infected with M. bovis.